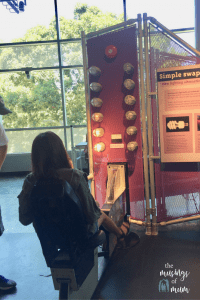 This week we visited the California Science Center for the first time. The museum is located in the Los Angeles Exposition Park and is near other museums attractions. There’s so much to see here! 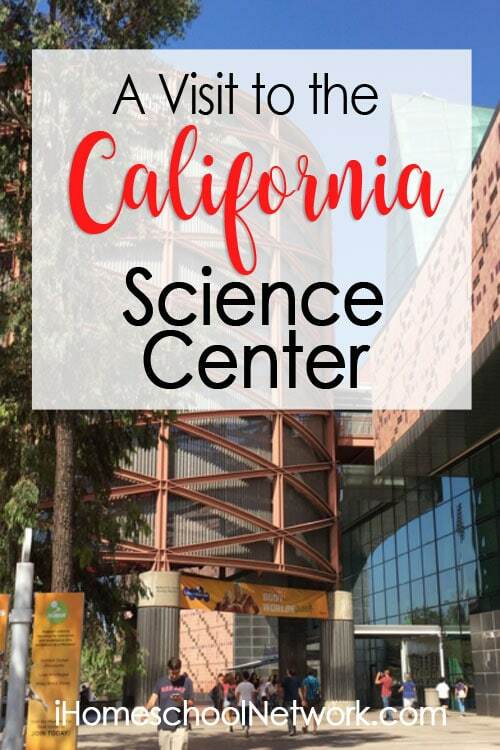 The California Science Center combines exhibits and hands on learning activities in a facility of over 400,000 sq ft. General admission is free to all permanent exhibits. The Science Center is the permanent home to the now retired Space Shuttle Endeavour, and also features an IMAX theater, that brings the smallest worlds to life on a 7-story screen. Our visit lasted roughly 6 hours, and a great deal of that time was focused on all Endeavour related exhibits. Some of the exhibits we missed this week, but plan on exploring next week are the World Of Life and Body Worlds: Pulse. Here’s a photo tour of some of the areas we explored. This exhibit houses a variety of live animals and kelp! This Touch Tank is located on the bottom floor of the Science Center. Visitors can experience an under water habitat, through 14″ glass. The under water habitat features different types of marine life, including sea bass, eels, sharks, as well as multiple types of kelp. The jelly fish were another highlight of our visit. We spent at least 10 minutes staring at this jelly fish tank. Features inventions in technology, communication and transportation. 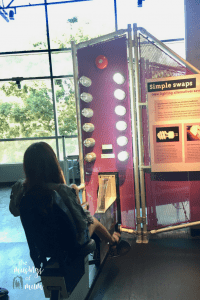 The energy required to light up the incandescent bulbs was 3 times as much as the halogen bulbs. The energy-saving bulbs lit up in no time. Though the museum covers 400,000 sq ft., over 3 floors of exhibits we spent the majority of our time focused on Mission 26: The Big Endeavour exhibit. These tires fly into space on Enveavour’s final flight. On August 1st 1987, final assembly officially began on Orbiter Vehicle 105 (OC-105), later known as Endeavour. The space shuttle was monitored remotely at the Rocketdyne Operation Support Center in Canoga Park. These stations are a replica of the Rocketdyne Operation Support Center. These simulators give visitors a little taste of what launching into space looks like. My girls and I enjoyed the very bumpy ride. Needless to say, we were completely mesmerized by the grandeur of Endeavour, and took close to 200 pictures in this exhibit alone! The Spacehab is used as an astronaut’s workshop. It serves as additional living space where the crew can conduct experiments, as well as store additional supplies. These tiles were another highlight of our visit. The space shuttle is covered with them, and they are a crucial part of keeping the craft and the passengers safe from life threatening heat. None of the 23,000 tiles are identical. The serial numbers tell the maintenance crew which one needs to be replaced. 23,000 of these tiles cover the surface of the space shuttle. These protect the shuttle from heat of up to 3,000 degrees fahrenheit upon re-entry. “The external tank (ET) was the fuel tank for the space shuttle orbiter. IT carried the propellants – liquid oxygen and liquid nitrogen – that mixed and ignited in the space shuttle main engines to help push the shuttle to orbit. Museum visits have become an instrumental part of our learning. In my opinion, there is no better way to develop true love and interest for a specific subject, than hands on experience. Most museums offer hands on interaction, whether it may come in the form of sketching at an art museum, or riding the high wire bicycle three stories up. Two of my girls sketching masterpieces at the Getty museum in Los Angeles, California. The girls riding a high wire bike at the California Science Center. There are many ways in which you can support your local museums. Here’s 5 reasons how you can support them, and why you should. Visit – Museums love visitors. This is why they stay open. Also, they LOVE homeschoolers. Volunteer – Do you have some extra time on your hands? Many museums have volunteers run their membership programs, events and galas. Become a member – Annual family memberships are affordable and give you access to exclusive exhibits and events. Also becoming a member will inspire you to visit more often! Donate – Donations keep the museums day to day costs covered. Most of us don’t have tons of resources, but every bit helps. Foster a love of art, history, science, etc. by exposing your children to it early on. Visiting local museums enhances the learning experience, by giving you access to history in the making, and allowing you to be a part of the innovation process. If you are anywhere near Southern California, or plan to visit in the future, I highly suggest you visit the California Science Center. If you’re not headed this way; no problem. Plan a visit to your local museum today.